Happy Holidays from Everyone at Korean-Arts! We are absolutely thrilled to be able offer a whole line of handmade jewelry, all made in Korea by Korean artisans. Our jewelry is designed and created the old-fashioned way; one at a time by hand, using the finest quality gemstones; turquoise, jade, onyx, and other materials such as, sterling silver, mother of pearl, and coral. What does handmade mean to you? 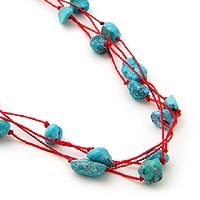 It means that since each piece is created by an artisan with new materials, the shape of each of the turquoise stones in the ‘Knotted Turquoise Necklace’, pictured at left, might not be the same shape as those pictured. But that is the appeal of handmade; it is not cookie-cutter and each piece has its own character. Additionally, since they are made one at a time, we will only carry limited quantities and will make new pieces as they are required. In other words, there is a possibility that the jewelry you order may be delayed by a week or so while it is being made. In such cases, we will, naturally, inform you. See the whole collection of eight necklaces here and the whole jewelry selection here! 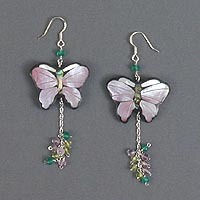 Handmade jewelry is all the rage in Korea and these ‘Butterflies on a Flower Earrings’ shown at right, illustrate why. They are made of mother of mother of pearl with pearlescent tones of purple and cream above pistil clusters of green, onyx, peridot and amethyst and give the impression of a butterfly setting down on a flower. We have thirteen styles of earrings. Click here to see the whole line. We also have broaches and cellphone fobs (in Korea we call them handphones) to brighten up your dreary handphone. Handphones are pretty much a fashion statement in Korea and having the right handphone fob it VERY important. See our Broaches and Phone Fobs here. is great for letters, cards, or for crafts, and works with your inkjet printer. See it here! In order to make your Christmas gift giving easier, and cheaper, we are offering free gift-wrapping for a limited time. From November 27 to December 3 (Korea time), for one week, you can have your order gift-wrapped and add a personal message to the gift for free. 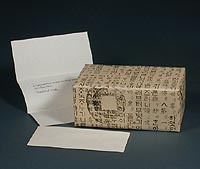 To take advantage of this offer, just add the gift-wrapping option to your shopping cart and we will gift-wrap your order in our unique, Hanji paper, and send it to the recipient of your choice. To add a personalized message with your gift by write your message in the ‘Notes’ section of the ‘Secure Checkout’ page when in-putting the shipping address, and we will send your message along with your gift on our beautiful Han-ji stationary and envelopes. We want to make sure your orders get to you on-time, as we are sure you do. To that end, we have set the following ship date times to insure you get your order on time. We can guarantee your standard order will arrive by Christmas if you place your order by December 7, and your Express order will arrive by Christmas if the order is placed by December 14 (Korea time). Click here for more details! 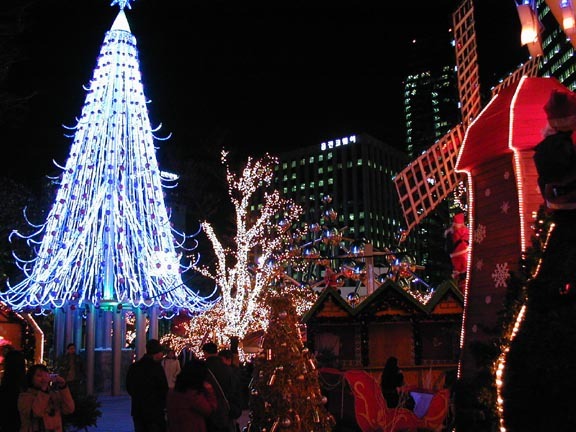 Although Korea is about one third Christian, it does not have a long Christian history, and as such, Christmas here is a little different than in the West. As in the West, Christmas tends to be more commercial than religious and so starting in mid-November many of the large shops and department stores in Seoul put up their holiday lights. Christmas trees start to appear near the end of November in plazas, hotel lobbies and department stores and many homes have small artificial trees but they are not usually set-up until a week or so before Christmas. With all the lights, Seoul at night is a really beautiful city, and there is a real feeling of holiday cheer. There are even street vendors selling chestnuts roasted on an open fire. Actually they sell those all winter long, and they taste great on a cold wintry day. The big holidays in Korea are Chuseok, which is the Korean Thanksgiving and is based on the lunar calendar so its date changes every year in relation to the solar calendar (the calendar used in the West). This year it was on October 6. The other big holiday is New Year’s Day. Koreans do celebrate the solar calendar based New Year’s Day (January 1), but the big holiday is the Lunar New Year which is the first day of the new moon and is based on the lunar calendar, so it changes on the solar calendar each year too just like Chuseok. In 2007 it is on February 17. For Chuseok and the Lunar New Year Korean families brave gridlock traffic to travel to their hometowns and gather with their families for three days. Compared to those holidays, Christmas is not such a big event to most Korean families. 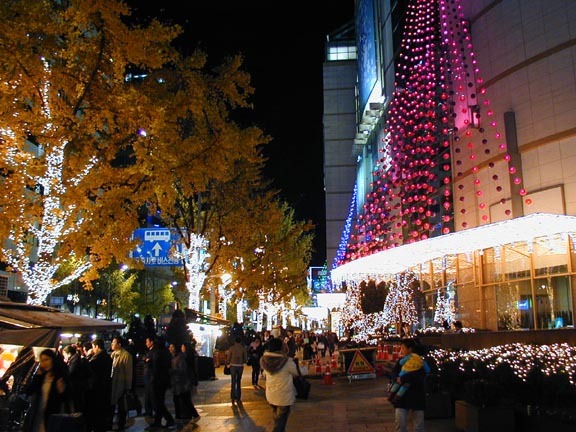 Families as a group usually don’t do anything special, but younger people, do take advantage of the romantic feeling of the season and all the beautiful lights, and frequently exchange gifts and meet with friends or lovers to enjoy a night out on the town on Christmas day. * Generally we send a newsletter every month, but may miss a month if we have no specials or new items.